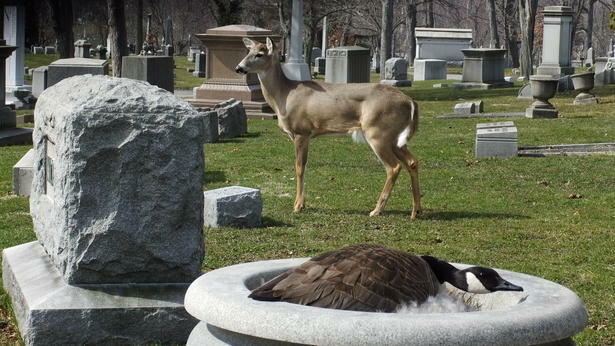 A deer has been standing watch for several days over a female goose nesting in a city cemetery, a scene normally reserved for a children's movie. "People always want to turn it into a Disney story and in this case it's not far off," said Gina Browning, director of the Erie County SPCA. 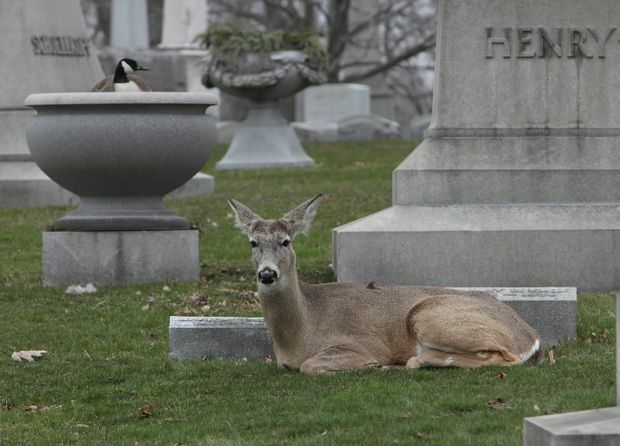 For at least four days, the buck stood guard near the nest of a Canada goose as she sits on her eggs inside a large urn at Forest Lawn cemetery, home to the remains of President Millard Fillmore and rock icon Rick James. "He does appear to be guarding the goose, as it were," Erie County SPCA Wildlife Administrator Joel Thomas said. "He's within touching distance of her -- there's no doubt what's going on." The deer, which he said looks like a buck that has shed its antlers, has not strayed from his post. "When someone approached the bird with a net, the deer puts itself between him and the bird, and he's repeated that behavior for some time,"
Typically positioning himself broadside to any car or passerby who comes near the nest, the deer stares intently until the potential aggressor moves on, he said. The gestation period for a Canada goose is up to 31 days, Thomas said, with the nesting season only just beginning. While normally both the male and female share the task of keeping the eggs warm, the expectant mother at Forest Lawn appears not to have that luxury. 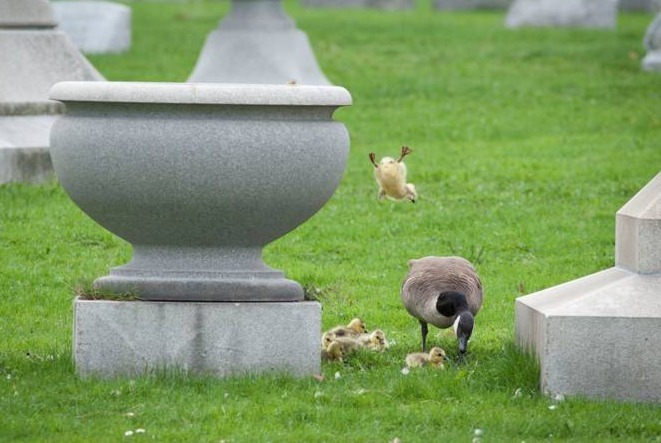 VIDEO: Deer Guarded Nesting Goose; Goslings Leave Goslings leave nest in cemetery which had been protected by deer. Responses to "Wild Deer Stands Guard Over Mother Goose Nest In Cemetery "
And there are her babies. Bless her the babies and the deer. God knows how to take care of those in need. not only is their bond unusual, but I find it surprising that any deer would not run away when confronted with a human. Perhaps it was raised by humans? I think too much info given about where--some lump of flesh might think it's cool to one or both for sport.